26 3/8" x 32 1/2"
The English translation of "fleur-de-lis" is "flower of the lily". This symbol, depicting a stylized lily or lotus flower has had many meanings throughout history. In its many forms, it can be traced back well over 2000 years to artifacts and coins from Mesopotamia, Egypt, Greece, Rome, Gaul and as far away as Japan. In the Middle ages, the fleur-de-lis evolved as a heraldic symbol used by kings and their ruling hierchy. The monarchy in France and England considered the fleur-de-lis a symbol of the blessed Trinity so the fleur-de-lis evolved into more of a Christian symbol and therefore began to be used in Crosses & Crucifixes. 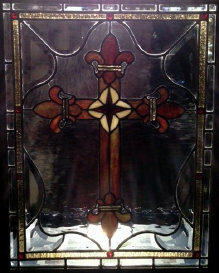 This Fleur-de-lis Cross window was built in June, 2012, contains 134 pieces of glass. I used some gorgeous royal blue/purple Armstrong opalescent glass for the cross, surrounded by clear waterglass and accented with 44 beveled pieces and 10 amber jewels. It comes ready to hang in its 2" stained and varnished Alder frame. 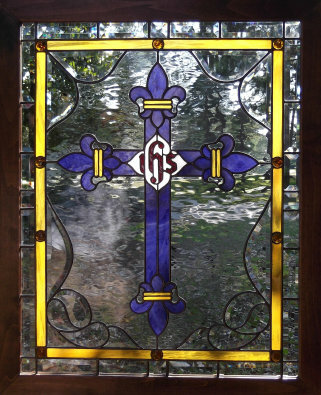 Over the years, I have built a number of transoms and windows with fleur-de-lis designs in them .... but never a cross. Back in 2003, I built 2 Celtic Crosses and resolved later to do some other cross designs. The Celtic Crosses are pictured to the right. Alan called me about building my fleur-de-lis design for his Mother-in-law. Knowing how important it is to keep a mother-in-law happy, I volunteered a little encouragement. Alan sent a photo of his finished Fleur-de-lis cross (to the right). What a magnificent job! 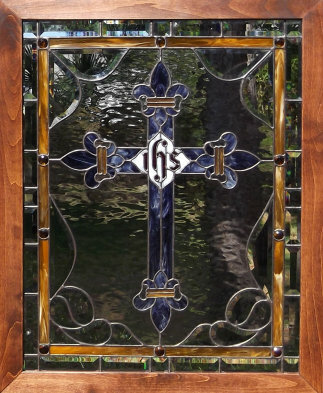 Alan's Fleur-de-lis cross measures about 21" x 26" in its beautiful rustic barnwood frame. His Mother-in-law proudly displays it in her home in Garland, Texas.